TAMPA, Fla. -- A University of South Florida alumna has received a prestigious National Science Foundation Research Fellowship grant, which will provide a $30,000 stipend and tuition for a maximum of three years. 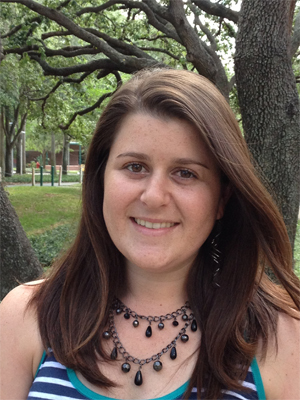 Holly Kilvitis will return to USF this fall as an NSF Research Fellow to pursue a doctorate in biology. Kilvitis, who graduated with a bachelor’s degree in biology from the Department of Integrative Biology in August 2011, will be studying epigenetics and ecoimmunology under the direction of Lynn “Marty” Martin, Ph.D., and Christina Richards, Ph.D. According to Kilvitis, epigenetics is the study of potentially heritable changes in gene expression brought on by environmental factors that do not involve alterations to the underlying genetic code, per se. Ecoimmunology is the study of natural variation in immune function and examines how this variation affects other physiological processes of the organism. Kilvitis, who worked full time at Bank of America while pursuing her bachelor’s degree at USF, said she was overjoyed when she found out she received the fellowship. “It will be the first time since I’ve been in school that I can focus solely on research and coursework without having to worry about working a full-time job,” Kilvitis said. Kilvitis said had she not established a relationship with Martin and Richards as an undergraduate, she would have never known about this fellowship. The NSF Graduate Research Fellowship Program helps ensure the vitality of the human resource base of science and engineering in the United States and reinforces its diversity. The program recognizes and supports outstanding graduate students in NSF-supported science, technology, engineering and mathematics disciplines who are pursuing research-based master's and doctoral degrees at accredited U.S. institutions.